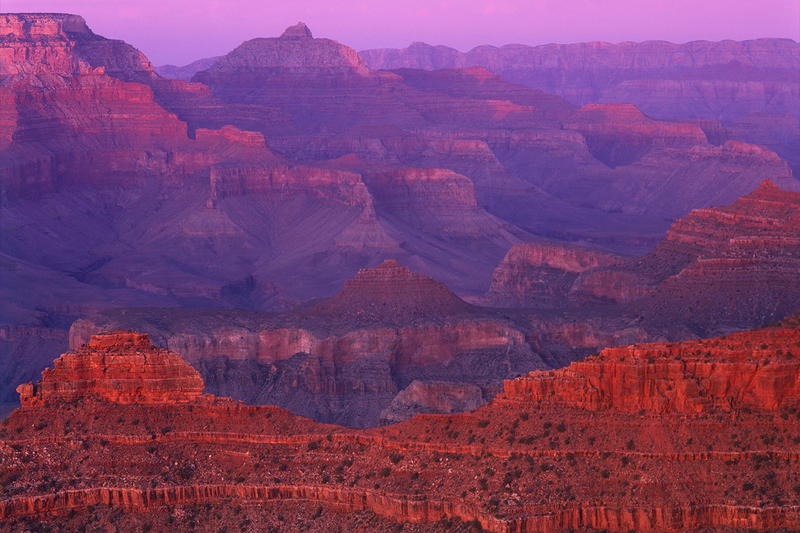 Soak in sunset and sunrise in Grand Canyon National Park at the South Rim. This 2-day, 1-night tour offers a full tour of Grand Canyon National Park and a tour stop highlighting Route 66 before arriving in Phoenix, AZ. Arizona’s wonder of the world is yours on this guided tour with the best views of the Grand Canyon South Rim. The Phoenix with Grand Canyon Overnight Tour* departs the Las Vegas strip between 6:00am and 7:00am and arrives in Phoenix between 7:00pm and 8:00pm. *Please note this is a one way tour ending in Phoenix. The hotel at the Grand Canyon will be 2-3 stars. The accommodation has been chosen to give passengers the best access to the National Park area. For those traveling alone there are single occupancy rates available. After departing Las Vegas, guests will travel through the Mojave Desert and over the Colorado River on their way to the South Rim of the Grand Canyon. The Mojave Desert is characterized by its signature plant, the Joshua Tree, and plays host to arguably to hottest place on Earth. To beat the heat, we will journey over the mighty Colorado River on the Mike O’Callaghan – Pat Tillman Memorial Bridge and pass along Route 66, the “Main Street of America,” to the top of the Colorado Plateau and Ponderosa Forests that surround the Grand Canyon South Rim. Before arriving to the widest and deepest part of the Grand Canyon National Park, the tour will stop in historic Williams, AZ. At the intersection of the Grand Canyon Railway and Route 66, this small town is a reminder of the American west from the 1950s. During your time in Grand Canyon National Park this first day, you will have opportunities to walk along the rim, shop, capture an unlimited number of photographs, enjoy your lunch and relax with the best seat in the house, and/or experience a helicopter tour or bicycle tour. Your DETOURS guide will ensure you get the best views from Mather Point and Yavapai Point before your hotel check in at the Grand Canyon. After your hotel check in, you will be able to further explore the Grand Canyon Village at will with the free park shuttles available. Lodging upgrades are available upon request. The morning hours will allow for time to relax, take sunrise photographs overlooking the Grand Canyon, or even do a morning hike. At approximately 2:00pm, your Phoenix-based DETOURS guide will pick you up from the front lobby of your Grand Canyon lodging to further explore the Canyon. 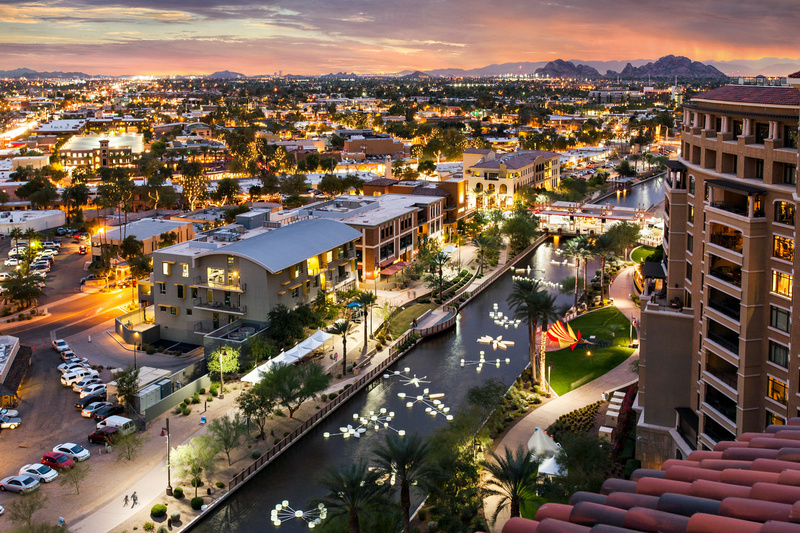 You’ll finish out your tour with a drive through the Ponderosa Pine Forest and Sonoran Desert as you head back into the Phoenix/Scottsdale area, with drop off at your hotel. Temperatures at the Grand Canyon vary by season. We recommend our guests bring jackets in the event of changing weather patterns. 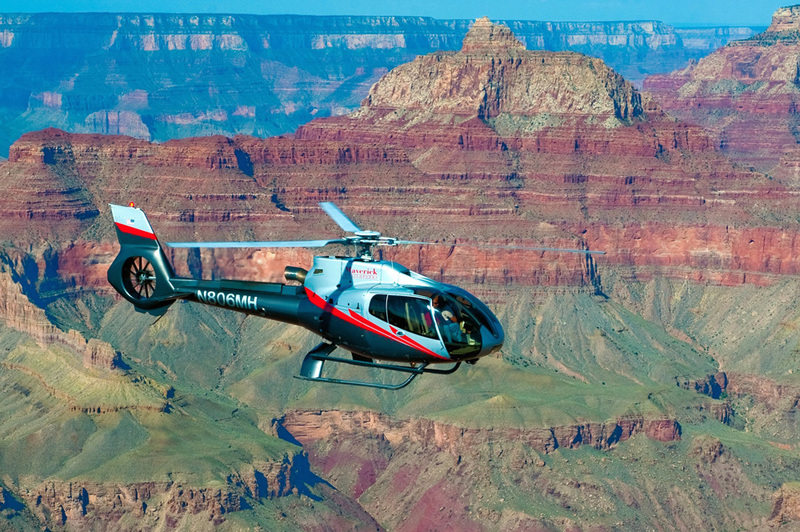 The Southwest Escape is a 45-minute Grand Canyon helicopter tour that departs from the South Rim of the Grand Canyon taking you over the beautiful Kaibab National Forest. Upon reaching the edge of the canyon, the South Rim gently drops away as the North Rim and eastern end of the canyon come into view – one of the most spectacular views in the entire canyon. In the distance, it is possible to see the Painted Desert and the Desert View Watchtower designed by the Hopi Indians. Your journey continues as you follow the Colorado River upstream to where it merges with the Little Colorado River. We book rooms at Maswik Lodge or Yavapai Lodge. For an additional cost, you can upgrade to Thunderbird Lodge or Kachina Lodge. To give you the best experience, pick up times are at approximately 6:00am, but the specific time depends on your pick up location. We will contact you between 4-6pm the evening before the tour to confirm your exact pickup time.